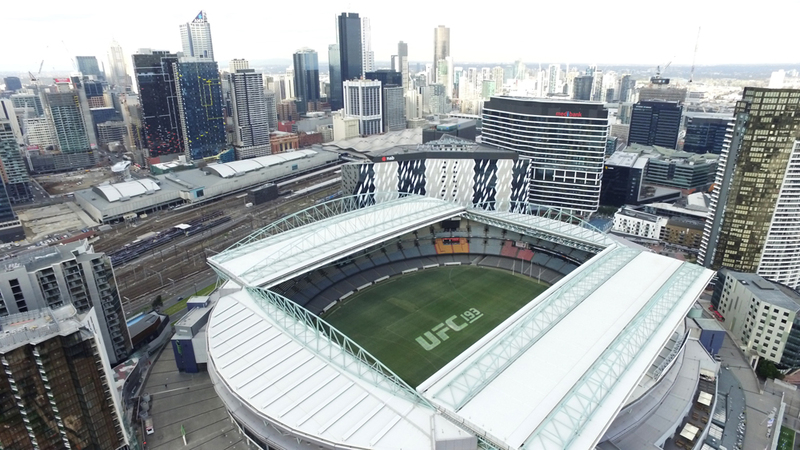 Melbourne, Australia – After years of anticipation, Australia’s sporting capital will play host to the biggest combat sports event the country has witnessed, as UFC® 193: LAWLER vs. CONDIT finds a home at Melbourne’s Etihad Stadium. In an Australian first, a UFC® championship belt will go on the line in the main event with welterweight champion Robbie Lawler slated to defend his title against former UFC interim welterweight champion Carlos Condit on Sunday, November 15, 2015. A special UFC® 193: LAWLER vs. CONDIT microsite - UFC.com/melbourne - launches today, providing registering fans with pre-sale access to tickets and event related information. Those who sign up will also receive a 30-day free trial to UFC FIGHT PASS®. Fighting for the first time outside of his native United States of America at UFC® 193: LAWLER vs. CONDIT, welterweight champion Robbie Lawler (26-10-0 1 NC, fighting out of Coconut Creek, FL, USA) is enjoying a renaissance inside the Octagon®. Since his return to the organisation in 2013, Lawler has won seven of his last eight bouts, including a tight split-decision victory over Johny Hendricks at UFC® 181 to claim the welterweight title. Most recently Lawler is coming off his first title defense at UFC® 189 over Canadian mixed martial arts prodigy Rory Macdonald, in an incredible five-round back-and-forth battle, which earned the ‘Fight of the Night’ bonus. Lawler is no stranger to fight bonuses, having earned ‘Knockout of the Night’ for his performance at UFC® 157 which signified his return to the UFC and the welterweight division. He also won ‘Fight of the Night’ against Johny Hendricks, when they first battled for the vacant UFC welterweight belt at UFC® 171, and against Matt Brown in a title-eliminator bout at UFC FIGHT NIGHT&trade;: LAWLER vs. BROWN. Set to face Lawler across the Octagon® at UFC® 193: LAWLER vs. CONDIT is Carlos Condit (30-8-0, fighting out of Albuquerque, NM, USA). Condit became the UFC interim welterweight champion after defeating bad-boy Nick Diaz at UFC® 143 in 2012. Owner of four ‘Fight of the Night’ and two ‘Knockout of the Night’ performance bonuses, Condit has competed and won against a who’s-who of the mixed martial arts welterweight elite including Rory MacDonald, Dong Hyun Kim and Martin Kampmann. Returning to the Octagon® in May 2015 after a 14-month injury lay-off, Condit has catapulted himself back into 170-pound title contention. A dominant win over Thiago Alves at UFC FIGHT NIGHT™: CONDIT vs. ALVES was a performance worthy of granting him another shot at the UFC welterweight title. - In the co-main event, Australian knockout artist and fan-favourite Mark ‘Super Samoan’ Hunt (10-9-1, fighting out of Sydney, Australia) and Brazilian behemoth Antonio ‘Bigfoot’ Silva (19-7-0 1 NC, fighting out of Coconut Creek, Florida, USA) will meet in the Octagon® once again to settle their 2013 ‘Fight of the Year’ draw, remembered as the greatest UFC heavyweight fight of all time. - Coming off an impressive first-round KO win over Brad Tavares, Robert Whittaker (14-4-0, fighting out of Sydney, Australia) will look to keep his unblemished record at middleweight and break into the division’s Top 10 with a win over brash Brit and perennial contender Michael ‘The Count’ Bisping (28-7-0, fighting out of Manchester, England). - Hometown hero and Australian rising star Jake ‘The Celtic Kid’ Matthews (9-1-0, fighting out of Melbourne, Australia) will be looking to jump back on the winner’s list against experienced Mexican Akbarh ‘El Caballero’ Arreola (23-9-1, fighting out of Tijuana, Mexico) at lightweight. - Pioneer Australian mixed martial artist Kyle ‘KO’ Noke (20-7-1, fighting out of Albuquerque, NM, USA) will continue his run in the welterweight division against Polish submission specialist Peter Sobotta (15-4-1, fighting out of Au, Balingen, Germany). - Light heavyweight veteran Anthony ‘The Hippo’ Perosh (15-9-0, fighting out of Sydney, Australia) will finally face American prospect Gian Villante (13-5-0, fighting out of Bellmore, NY, USA). The pair were originally set to meet at UFC FIGHT NIGHT™: TE HUNA vs. MARQUARDT in June 2014, but Perosh was forced to withdraw due to injury. - Four-time Australian Olympic Judoka Daniel Kelly (9-1-0, fighting out of Melbourne, Australia) will relish the opportunity to compete in front of his home crowd taking on Brazilian jiu-jitsu specialist Ricardo Abreu (5-2-0, fighting out of Huntington Beach, CA, USA) in a middleweight tilt. Additional bouts for UFC® 193: LAWLER vs. CONDIT will be announced in the coming weeks. Tickets will be available at www.ticketmaster.com.au. Ticket prices will be available at a later date. UFC Fight Club® members will have first access to purchase tickets starting on Monday September 14 at 10 a.m. AEST via the website www.ufcfightclub.com. The presale will then extend to UFC® 193: LAWLER vs. CONDIT microsite registrants and UFC newsletter subscribers, starting at 10 a.m. AEST on Wednesday, September 16. To access this presale, users must register via the UFC® 193: LAWLER vs. CONDIT microsite at UFC.com/melbourne. General on sale will commence on Monday, September 21 at 10 a.m. AEST. Sign up at UFC.com/melbourne to receive UFC VIP Experience package information. The UFC VIP Experience packages together your tickets with behind-the-scenes access to the official weigh-ins, meet and greet and autograph signings with top UFC stars, Q&A sessions, and photo opportunities, access to an in-arena VIP hospitality room, a chance to hold the championship belt inside the Octagon® and more. UFC® 193: LAWLER vs. CONDIT will be available live on Pay-Per-View at 10 p.m. ET/7 p.m. PT on UFC.TV, iN DEMAND, DirecTV, DISH Network, Vubiquity, in Canada on Bell TV, Shaw, Sasktel, Rogers and Canal Indigo for a suggested retail price of $49.99 US/CAN for Standard Definition and $59.99 US/CAN for High-Definition, in Australia on Main Event and in New Zealand on SKY. Since 2010, the UFC has hosted seven live events in Australia with each experiencing tremendous success. Collectively, the seven events have seen more than 85,000 fans in attendance and millions worldwide watching on Pay-Per-View and broadcast television. The four host cities to date – Sydney, Gold Coast, Brisbane and Adelaide – have had a cumulative gross gate of more than $13 million and millions more in economic impact. UFC® is the premier mixed martial arts (MMA) organization and largest Pay-Per-View event provider in the world. Headquartered in Las Vegas with offices in London, Toronto, Singapore and Sao Paulo, UFC produces more than 40 live events annually that consistently sell-out some of the most prestigious arenas around the globe. UFC programming is broadcast in 158 countries and territories to over 1 billion TV households worldwide in 21 different languages. In Australia, the UFC has broadcast agreements with Fox Sports Australia and MAIN EVENT, which includes live events broadcasts, The Ultimate Fighter&reg; reality television show and thousands of hours of programming. In 2014, UFC launched UFC FIGHT PASS®, a digital subscription service that is available throughout the world with exclusive live events, thousands of fights on-demand and original content. The UFC organization also licenses over 100 UFC GYM® locations, and owns UFC.TV® (offering live event broadcasts and video on-demand around the world), UFC FIT® (an in-home fitness and nutrition program), UFC Magazine, and has a videogame franchise with EA SPORTS, UFC Fight Club®, UFC Fan Expo®, UFC branded apparel, DVDs and Blu-rays and Topps Trading Cards. For more information, visit au.ufc.com and follow UFC on Facebook at www.Facebook.com/UFC, on Twitter @UFC_AUSNZ and Instagram @UFC. More than 33 million fans have passed through Etihad Stadium’s gates since the venue opened in March, 2000. Etihad Stadium still remains the only football stadium in the Southern Hemisphere with a fully retractable roof, and has a capacity to seat under cover more than 53,500 seats. Etihad Stadium was the first development in Melbourne’s Docklands precinct. Since its construction, it’s often said Etihad Stadium provided the impetus for countless other developments, leading to an exciting and vibrant component of the city. During its 15 years Etihad Stadium has, apart from hosting domestic sporting events, including all major football codes, hosted some of the globe’s biggest international performers. Some household names and bands includes Bon Jovi, Robbie Williams, Barbra Streisand, Taylor Swift, AC/DC, Foo Fighters, Cold Play and many others.